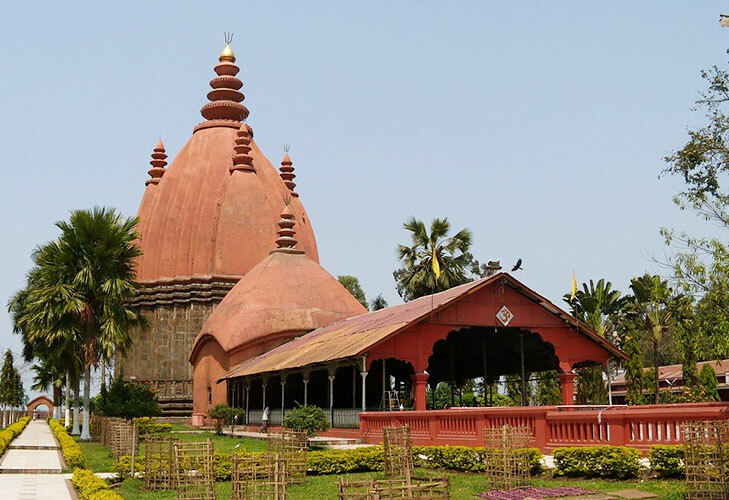 369 kms from Guwahati – Sibsagar an historical city. Sibsagar was the capital of the mighty Ahoms, who ruled Assam for more than six hundred years before the advent of the British. The most remarkable landscape of the town is the 200 year old Sibsagar tank. On its banks are three temples– the Shivadol, the Vishnudol and the Devidol– all three built by Queen Madambika, wife of Siva Singha, in the year 1734. The Shivadol is believed to be the highest Siva Temple in India, having a height of 104 feet and the perimeter 195 feet. The tank is situated in the heart of the town but the water level is above the level of the town. Today Sibsagar is a fast developing town in commercial, industrial and educational activities. The town, which literally means ‘the ocean of Lord Shiva’, is strewn with the tell-tale ruins of a powerful empire. The most remarkable landmark of the town is the 200 year old Sibsagar tank. On its banks are three significant temples – Shivadol, Vishnudol and Devidol. Modern Sibsagar is a fast developing urban settlement. It is the headquarters of the district Sibsagar, a leading tea and oil producing centre. About 6 km from Sibsagar is an immense seven storeyed palace, three of which are below the ground level – known as Talatal Ghar – and the rest of the storeys above. There are two secret tunnels here. 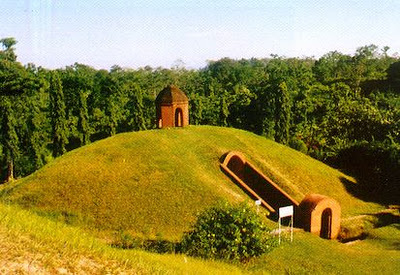 These historical monuments were built by King Rudra Singha during 1696-1714 AD was the military station of the Ahom Kings. It is a seven storied palace having three storeys underground- known as Talatal Ghar and the the upper storeys known as Kareng Ghar. The entire structure are of historical and architectural interest. Gargaon, the erstwhile capital of the Ahoms, lies 13 km east of Sibsagar. The old palace built in 1540 was destroyed, and the present seven-storeyed palace, known as Kareng Ghar, was rebuilt around 1762, by king Rajeshwar Singha. This amphitheatre was built by King Pramatta Singha. This two storeyed oval shaped pavilion is one of the largest of its kind. An another old capital of the Ahom kings, Charaideo, built by the founder of the Ahom dynasty, Sukapha lies 28 km east of Sibsagar. It is famous for the ‘maidans’ or burial vaults of the members of the royalty. Joysagar, believed to be the largest man-made lake in India, sprawls over 318 acres on the edge of Sibsagar town. 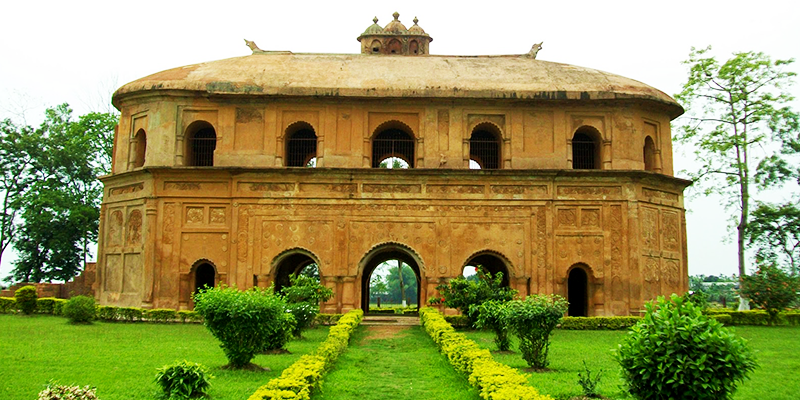 Another highlight is the Ahom Museum on the bank of the Sibsagar, which houses artifacts of the Ahom rulers, which include clothes, swords, manuscripts, goblets and platters. The Jaysagar tank was built by king Rudra Singha in 1697. On its bank are three highly revered temples – Joydol, Shivdol and Devidol. The Gaurisagar tank was built by queen Phuleshwari Devi. Standing on its bank are three temples – Vishnudol, Shivdol and Devidol. The Rudrasagar tank was built by king Lakshmi Singha in 1773. It is 8 km from Sibsagar. The Namdang bridge, cut out from a single solid rock over the Namdang river, was constructed by king Rudra Singha in 1703. Today, the National Highway 37, passes over this bridge. Air – The nearest airport, Jorhat, is only 55 km away. Rail – The nearest railhead, Simaluguri, is 16 km away. Road – Bus services are available from Guwahati and other important towns. Dear Mr.Dasgupta Although this was my 1st trip to North East India (Meghalaya and Darjeeling – Gangtok), but the arrangements that you have managed is really awesome. The moment that our INDIGO vehicle was out of order on the way to Shillong, I was frightened, but with in a few minutes you have arranged another one – the services that you people are offering to your guest is really mind blowing.